When placing an order for goods or services, it is a norm that an order form is generated and submitted to the customer. It contains the list of items or services for which the customer has to pay the stipulated amount displayed at the end of the items and price tally in the document. There are several types of Order Forms available and which are used in businesses. We give you a lineup of the most popular ones. A purchase order form is a professional document used by businesses to note down the specifics of the items which a customer has purchased. The purchase order form has fields such as customer’s name, contact information, description of goods, quantity, destination of the delivery, location address, amount payable, mode of delivery and date of delivery. A sample work order form is useful for clients who are heavily into getting tasks and duties accomplished by third-party service suppliers. A contracting job for example, if a client has hired a contractor to perform some repairs or new construction work, the client will firstly send a work order form specifying the details of the work which is expected to be done, along with other important details related to the task. An HR personnel is given a job order form by their employer for finding qualified candidates to fill up the vacant positions in the company. The form contains structured records wherein the vacant job profiles and requirements for each is clearly mentioned. Such forms are reviewed and must be at par with the company’s laws and policies. 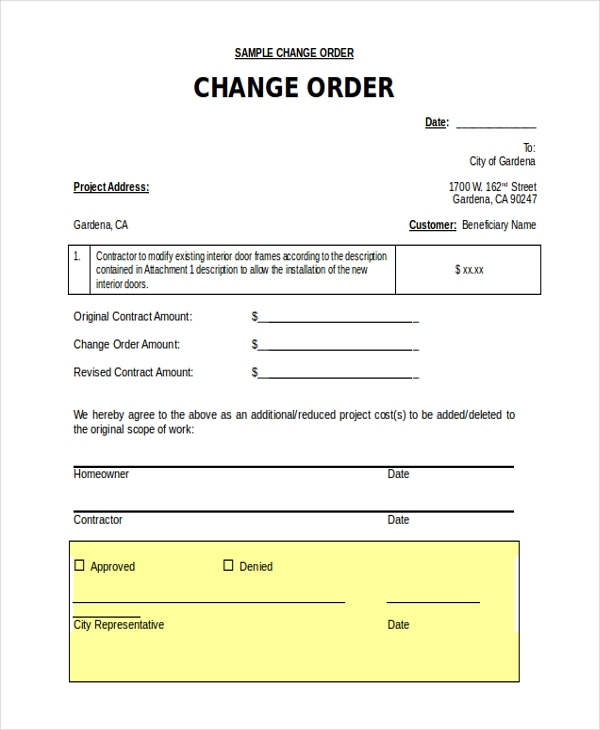 In case there is a change in a work order or a contract, the changes are informed via means of a change order form. The new and revised requirements are mentioned in detail and it is also specified that the earlier directives must be considered null and void after this change order form is received by the company or client responsible. 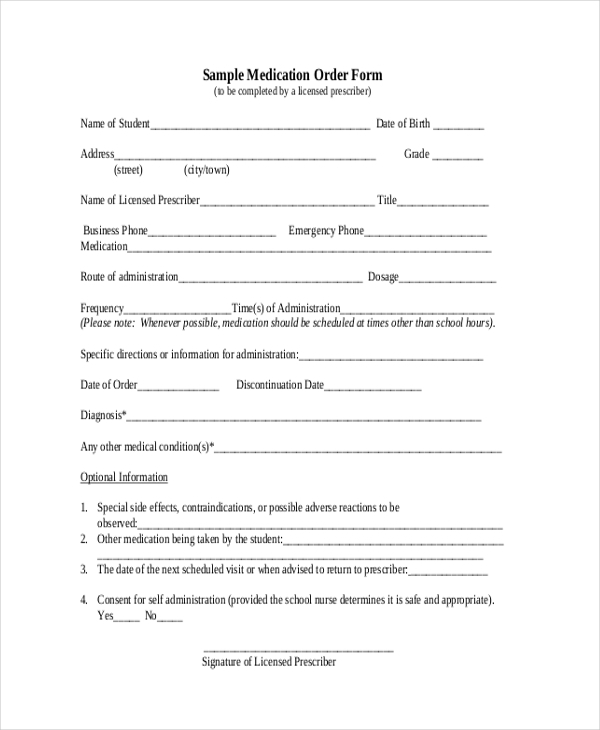 A medication order form is similar to a doctor’s prescription. Such a form is usually used in schools by doctors. 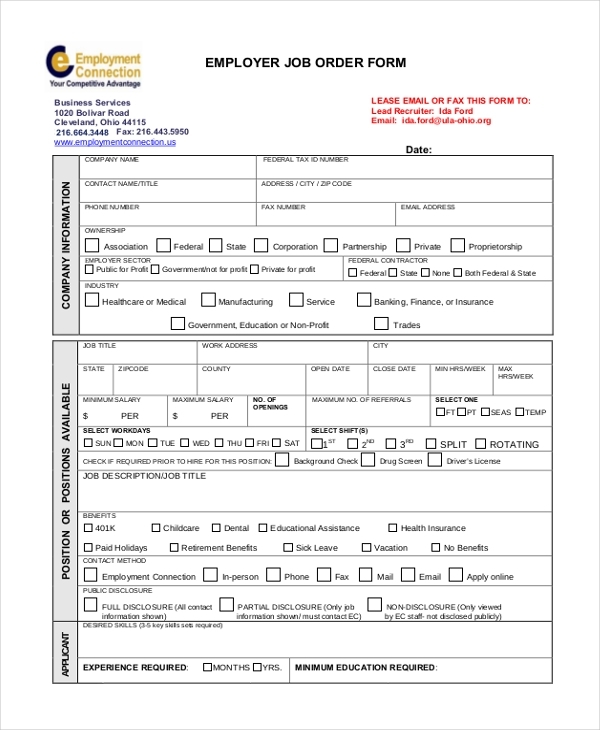 This form is utilized by medical practitioners when patients approach them for consultation. The directions of using medication are provided in detail and signed by the doctor. 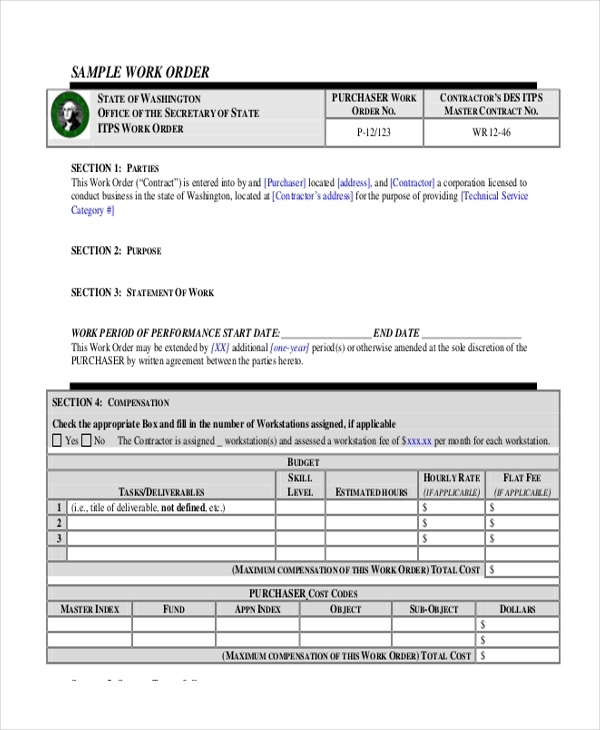 A sample request order form is a document wherein the specifics of the customer who has ordered for the said samples is specified – such as customer name, contact number, shipping address, the name of sample deliverables, mode of payment, payment details. If a client wants to see a sample brochure designed by a designer, he or she will make use of a sample brochure order form to make an order. The name of customer, contact details has to be clearly mentioned in the form, followed by a table wherein the deliverables are spelled out – description, quantity, and price. Lastly, there is customer signature. If you’re planning on getting a new license plate for your vehicle, you may as well get hold of some samples first before you make the choice. 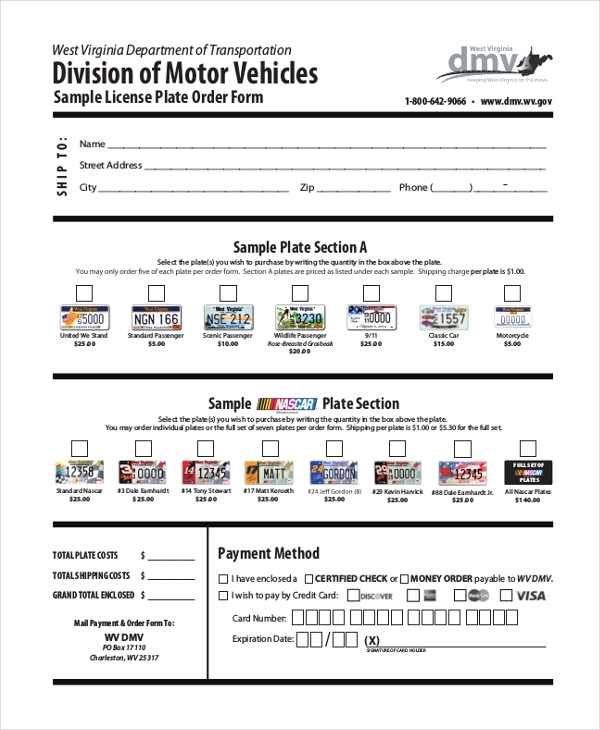 A sample license plate order form helps you fulfill just that. Just select the license plate which you want to purchase and order for and fill out your personal and contact specifics, including the method of payment. 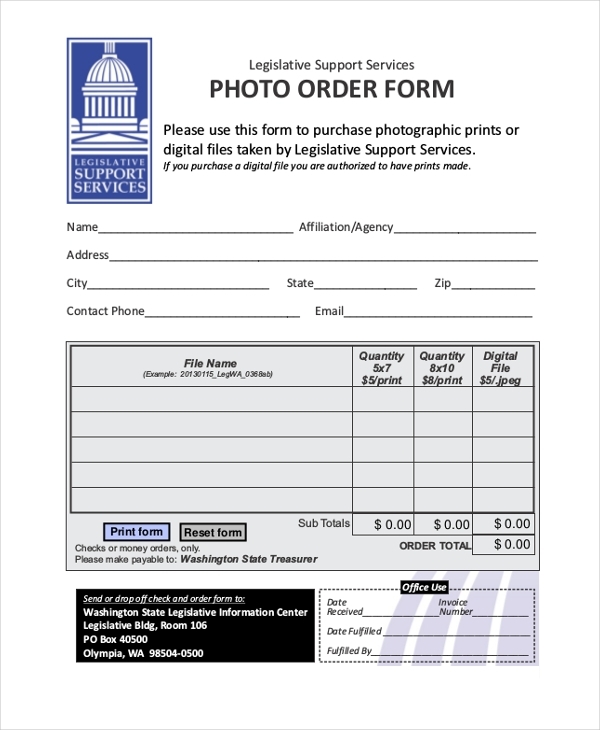 Do you want to purchase a particular photograph from a photo studio or another authority, make use of sample photo order form to place an order for a photograph. As it is the case with every order form, the customer’s name, and contact detail along with date and time, the address of delivery also need to be in the form. The total price payable and mode of payment must also be mentioned. The biggest plus of sample order forms is that they contain information in the written form. Anything which exists in the written form automatically becomes very valuable, especially if it is a transaction or exchange of some kind. Moreover, sample order forms are very versatile. A generic sample order form can be used in a universal manner for all kinds of businesses – be it for products or services. 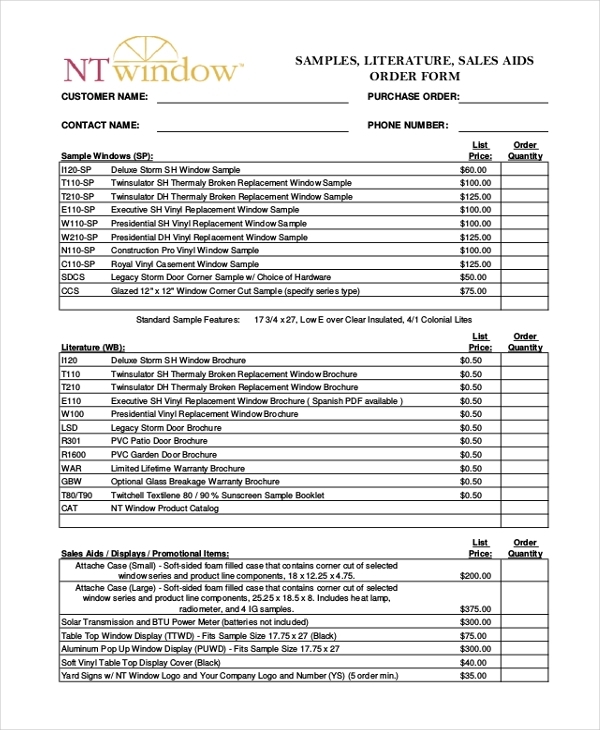 You may also see Purchase Order Forms. Sample order forms are available in various file formats – PDF, MS Word, MS Excel and even PSD. The USP, of course, is that whatever order form varieties are available on the Web, all of them are fully-customizable and edit-friendly. If you need to get hold of a sample order form in a jiffy, put your faith in any of the websites which offer these templates. Remodel and customize them in any way you wish and create an order form which is fitting for your business. You can also See Appraisal Order Forms. 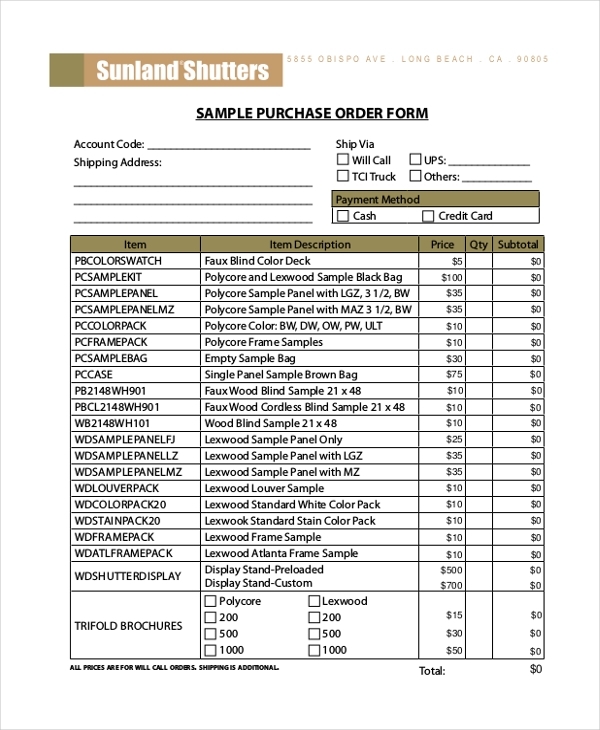 Sample order forms are documents of proof of purchase. The primary use of sample order forms is to establish a kind of transparency between the client and vendor. In the case of any miscommunication or typo, a sample order form can be used as a reference and any typos can be immediately rectified. Sample order forms are widely used in all kinds of businesses.